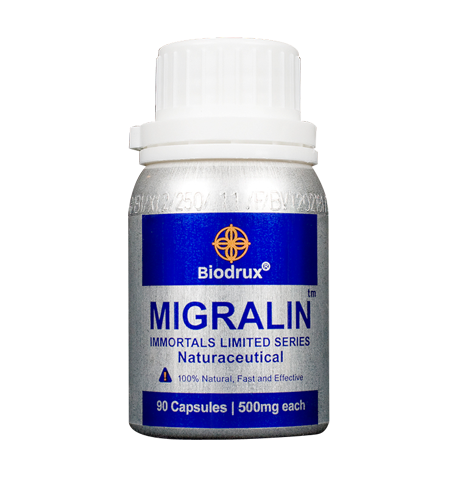 Migralin is for people with frequent and extreme headaches and/or migraines. Migralin is for people with frequent and extreme headaches and/or migraines. It is for people who want to stop headache related vomiting, tunnel vision, temporary blindness, and diarrhea. A migraine is a severe vascular headache. Both migraines and headaches are caused by the enlargement of your blood vessels, known as vasodilation. Vasodilation causes the release of chemicals from your nerve fibers, which is the cause of your headache and/or migraine. These chemicals cause inflammation, pain, and further enlargement of the artery. The increasing enlargement of the arteries magnifies the pain. Once you have a headache or migraine, your sympathetic nervous system is set at high alert. Symptoms associated with headache and migraine attacks, include nausea, vomiting, diarrhea and increased sympathetic nervous activity in the intestine and liver which manifests as photophobia. Photophobia is acute sensitivity to light. Photophobia may cause temporary blindness and/or tunnel vision. In order to stop the onset of migraines, you must both stop the pain associated with them and correct the underlying imbalances that continue to cause them.